EMERGENCY TWO WAY RADIO WITH NOAA WEATHER ALERT!! NOW LICENSE FREE!! Be prepared for the unexpected with the Motorola Talkabout T480 FRS/GMRS two way radio! The T480 helps you stay connected and ready for an emergency when cell phone service is down or you lose power. 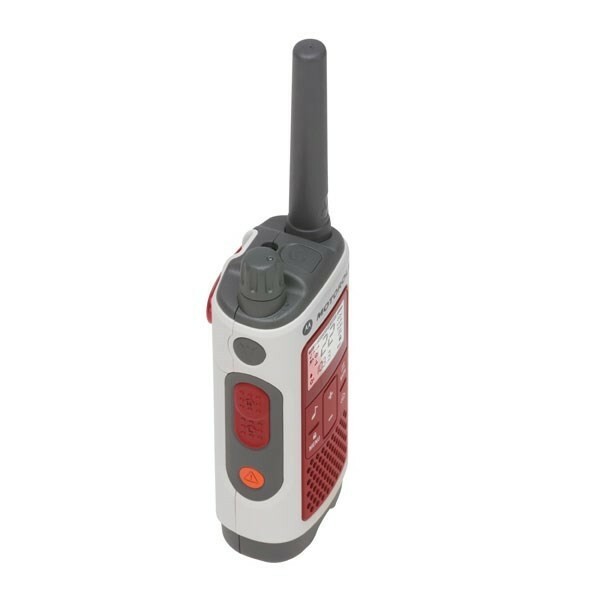 It has 22 FRS/GMRS channels, NOAA weather channels, weather alerts and an FM radio to keep you and your family in communication and informed during emergency situations. The Talkabout T480 features a backlit LCD display, 121 privacy codes, 20 call tones, Quiet Talk filter, channel scan, hands-free iVOX/VOX functionality and an emergency alert button. The built-in LED flashlight automatically activates when the radio is unplugged or the power goes out. The T480 also offers dual power options. You can power it with the NiMH rechargeable battery pack (included) or 3 standard non-rechargeable AA alkalines (not included). The T480 is equipped with a built-in micro-USB port so you can charge the radio with the included AC charging adapter. The Motorola Talkabout T480 comes with one Motorola T480 two way radio, micro-USB AC wall charger, NiMH rechargeable battery, whistle belt clip, desk/wall stand, owner's manual and a one year manufacturer warranty. The Talkabout T480 is compatible with all other FRS/GMRS radios on the same frequency and privacy code.